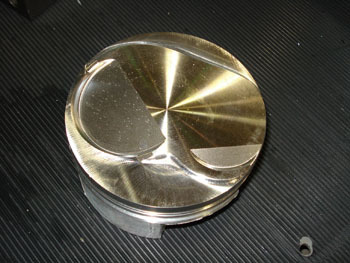 Detroit, MI -- When we last left you, I had just returned our Zircon mock up piston to the good folks at Diamond Racing Products and they were in the process of finalizing the design and manufacturing of our actual pistons. After verifying a few details, such as valve location, the Diamond Racing Engineering Department got to work on finalizing our piston’s production design. Diamond’s designers again go back to the data generated from the CMM-coordinate measurements of our ET Performance produced combustion chambers to begin the design process. Mike Panetta, from the Diamond Sales staff, also provides the remaining specifications that are pertinent to our combination. 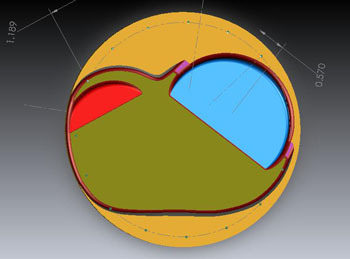 Diamond’s designers then pour all of that information into their Computer-Aided mixing bowling to come with a 3-Dimensional CAD design that serves as the foundation of the programming for the CNC machine programming that will cut our pistons. After the CAD design has been approved, it’s sent to the shop to undergo Diamond’s proprietary manufacturing process. The Diamond process is closely guarded so it was difficult to get specific information. Fortunately, Diamond management was gracious enough to provide plenty of general information and a few excellent photographs of our piston ‘in-process’ to go with it. The shop floor at Diamond is a model of efficiency and Rob Giebas, Diamond’s Shop Foreman, runs a tight ship, working hard to assure each order meets it scheduled delivery date. 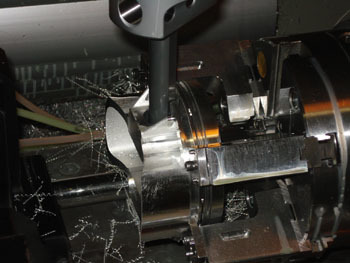 Each new machining process is located only arms-length away from the preceding process. When the order hit the floor, it’s typically processed very quickly, often in only a week. The real trick is getting through the job list that reads like a ‘who’s who’ of drag racing. Now let’s get started… To begin, the Engineers at Diamond specified a really deluxe new forging that’s incredibly strong, yet doesn’t pack the weight that’s usually associated with the term ‘high strength’. 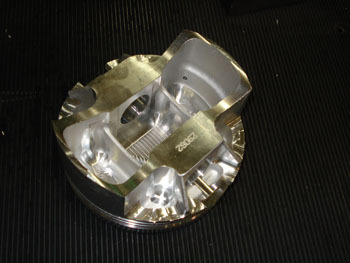 This forging is exactly the ticket for our high revving nitrous engines! Diamond’s Machinists load the specified forging into the fixture that’s used to turn the barrel, or outside diameter of the piston. This, along with two machined grooves and flat cut at the base of the skirt serve as the reference points until the semi-finished wrist pin hole is bored. 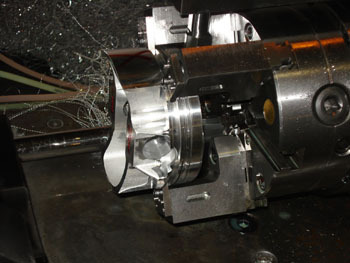 Once that happens, the pin bore will serve as the primary locating feature for each of the remaining procedures. Now that the wrist pin hole has been bored, the Spiro Lock grooves are cut. Then it’s on to machining the dome profile and the valve-relief pockets. The dome height is then turned to achieve the desired volume required for our target compression ratio. Now it’s time for the Ring Land turning operation, Oil Return & Wrist Pin oiler holes, and Gas Port drilling. 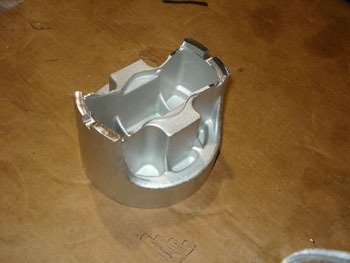 Gas Ports act as minature tunnels between the deck of the piston and the bottom of the ring groove. These tunnels channel a small amount of combustion pressure to the back-side of the top ring to help keep the top ring pressed tightly against the cylinder wall for better cylinder sealing – which simply means MORE POWER! 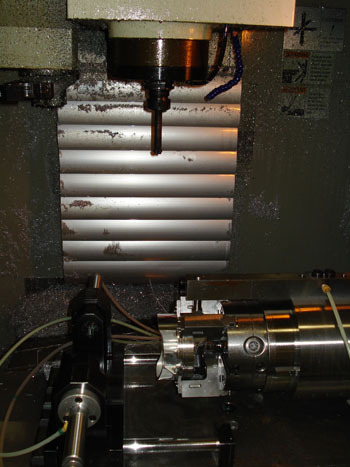 For the sake of precision, the Diamond folks finish boring the wrist pin hole and then secondary ring land machining process as the last step before heading into the box and to your door. Only 10 days after the Pelech Bros. Racing piston order was placed, the finished pistons were delivered along with wrist pins and locks from Diamond’s sister company, Trend Performance. Trend Performance offers premium wrist pins in most standard sizes and made to order custom sizes. Diamond Pistons offers these wrist pins in 4130 Chrome Moly, H-13 Tool Steel, 9310 Alloy, and now – C350 Maraging providing the ultimate in tensile strength! Call Diamond’s knowledgeable Tech Staff to see what pin fits your application and also be sure to ask about Diamond’s ‘in-house’ coating services. Copyright © 1999-2008 Pelech Bros. Racing, All Rights Reserved.